Community Conversation: Facing Eviction through Compassionate Action (Double Session) April 10. Learn more. Community Conversation: Facing Eviction through Compassionate Action (Single Session) April 29. Learn more. 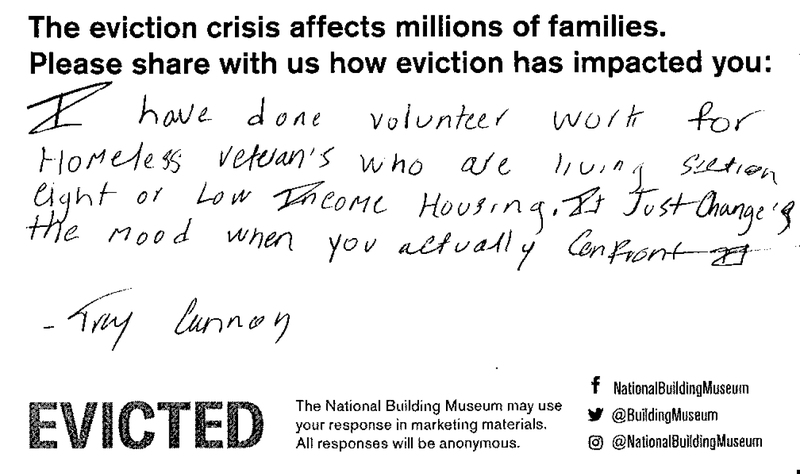 The Museum is reaching the final months of Evicted before it closes and begins traveling, starting in the Milwaukee, Wisconsin, where Matthew Desmond followed eight families struggling with chronic eviction, whose stories were the basis for his research and book. 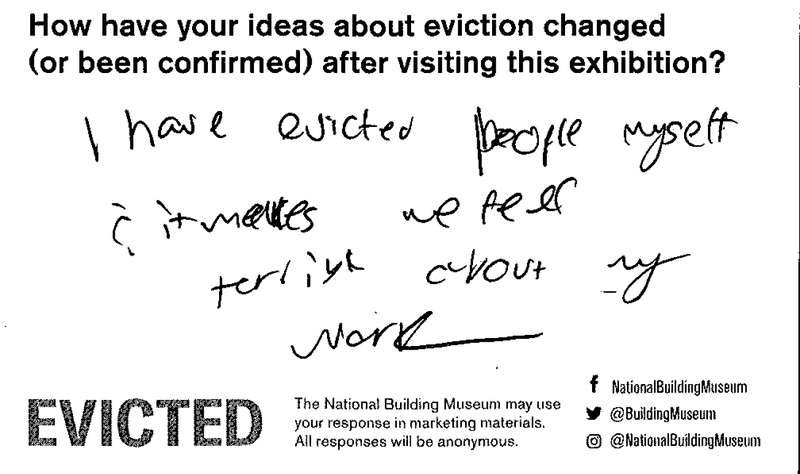 The exhibition has since collected nearly 150 cards written by visitors. 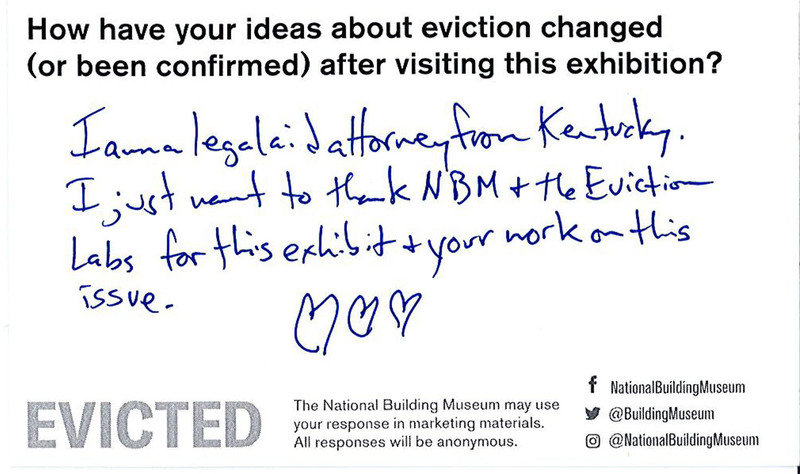 The collection below focuses on visitors who have worked in jobs and careers surrounding the eviction process, whether that is as a legal aid or as a landlord. We welcome you to read these stories and submit your own. 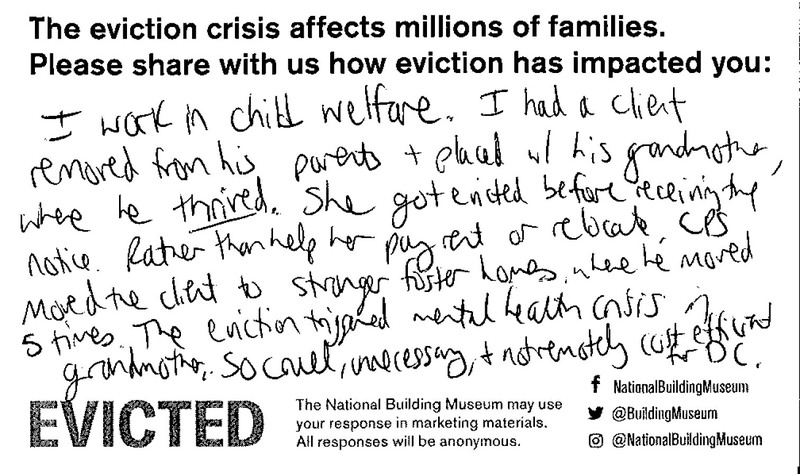 You can read the first set of cards written by those who have experienced eviction here. Such an excellent exhibit. I’ve been a renter for many years and then became a landlord too. One renter could not pay her rent and I tried so hard to be patient for her but I had my own bills to pay and a family to support. 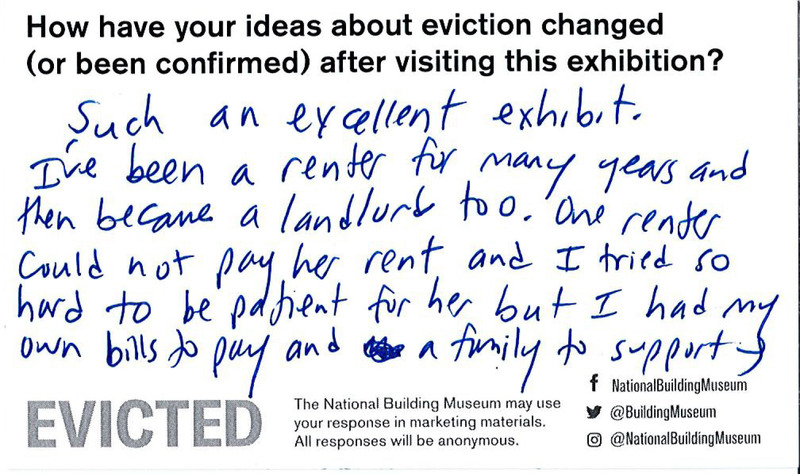 I only rented to her because we could not sell our apartment, consequence of the housing crisis) the only people who wanted to buy our home were greedy developers who offered much less than its value. Greed started the crisis and its effects were (and are) far reaching. 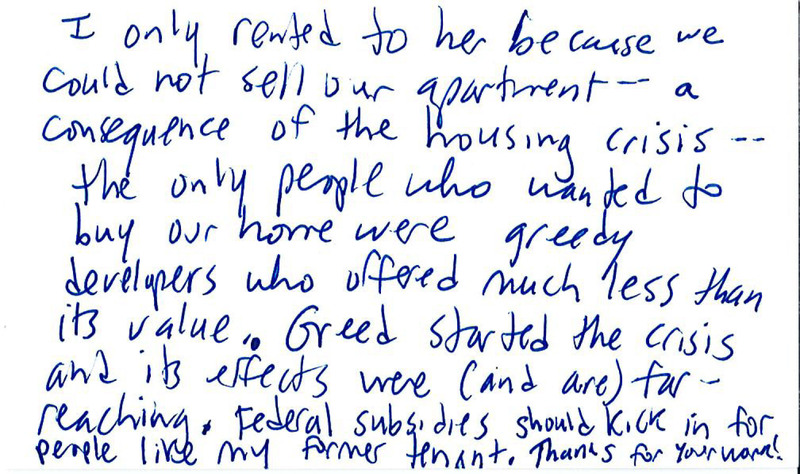 Federal subsidies should kick in for people like my former tenant. Thanks for you work! I have done volunteer work for homeless veterans who are living in section eight or low income housing. It just changes the mood when you actually confront it. I have evicted people myself it makes me feel terrible about my work. 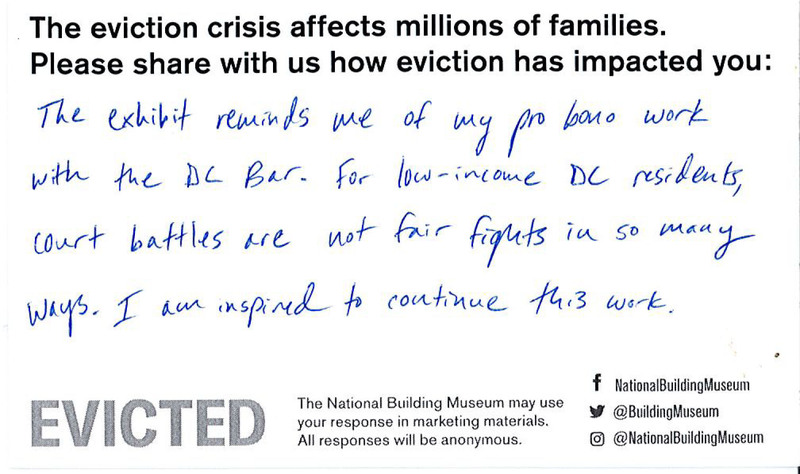 The exhibit reminds me of my pro bono work with the DC Bar. For low-income DC residents, court battles are not fair fights in so many ways. I am inspired to continue this work. I am a city planner in Dallas, Texas. One of our focuses is on neighborhood engagement and revitalization. 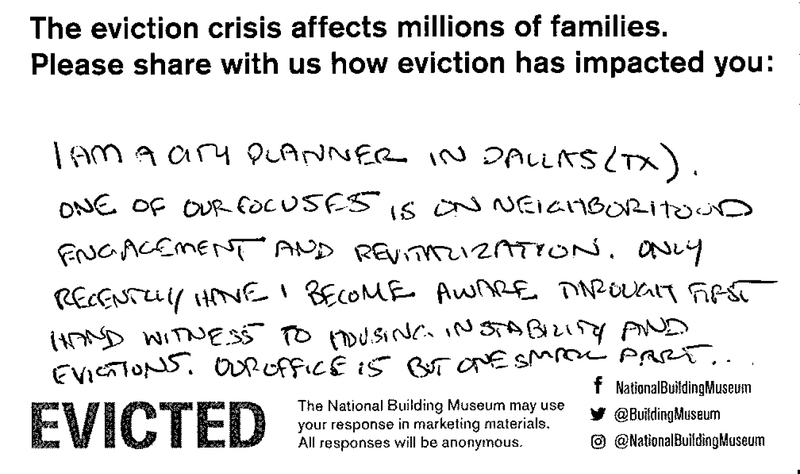 Only recently have I become aware through first hand witness to housing instability and evictions. Our office is but one small part of the solution. 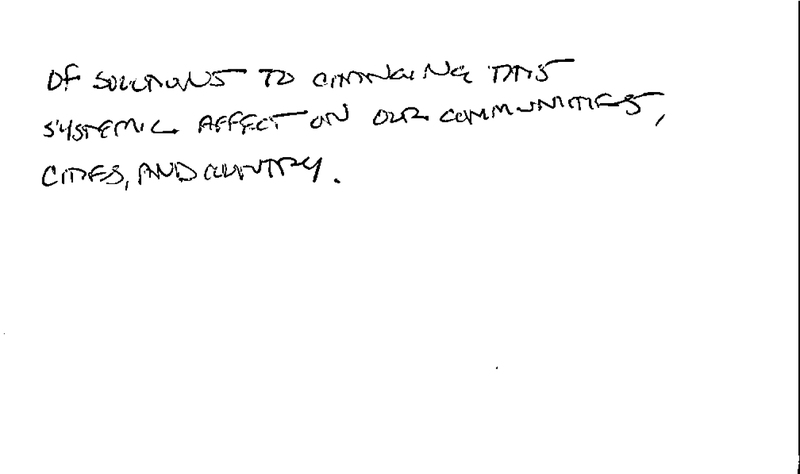 This systematically affects our communities, cities, and country. 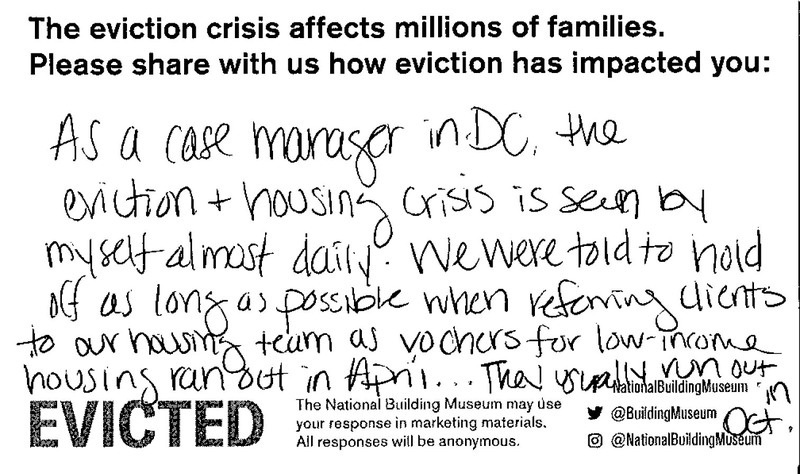 As a case manager in DC the eviction + housing crisis is seen by myself almost daily. We were told to hold off as long as possible when referring clients to our housing team as vouchers for low-income housing ran out in April…they usually run out in Oct. I am housing policy director in Colombia. 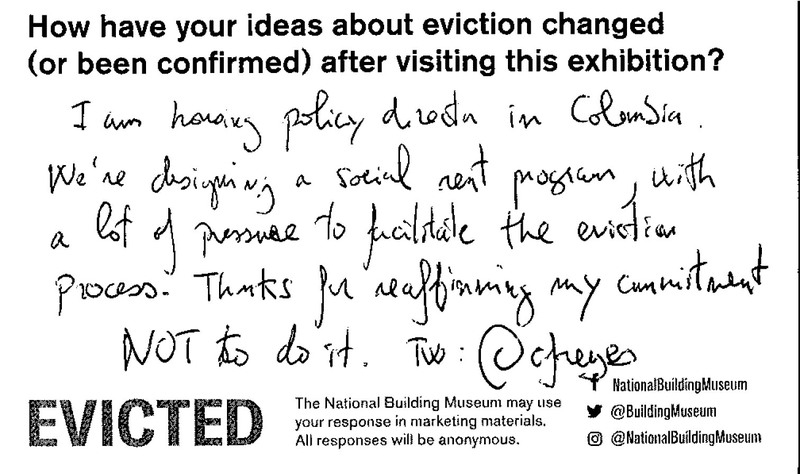 We’re designing a social rent program, with a lot of pressure to facilitate the eviction process. Thanks for reaffirming my commitment NOT to do it. I am a law student who observed DC LT Court today. Attorneys at the Landlord Tenant Resource Center told me that evictions are proceeding today with the city marshals. The weather is low 28 degrees, high 34 degrees, it’s very cold. 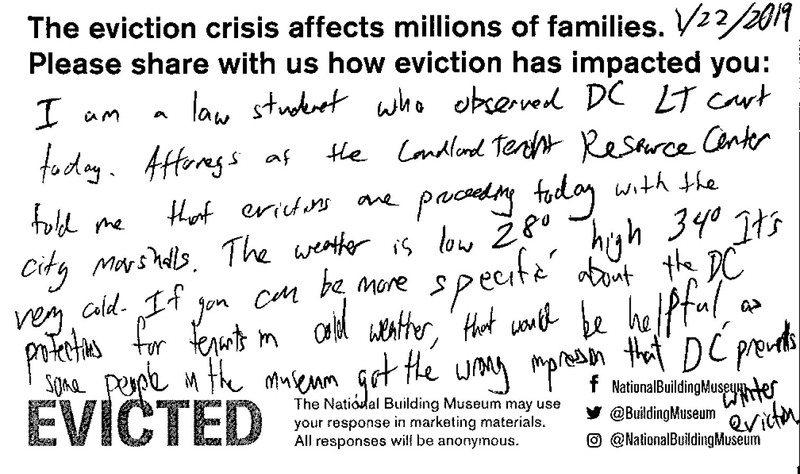 If you can be more specific about the Cc protections for tenants in cold weather that would be helpful as some people in the museum got the wrong impression that DC prevents winter eviction. I work in child welfare. I had a client removed from his parents + placed with his grandmother. Where he thrived/ She got evicted before receiving the notice. Rather than help her pay rent or relocate, CPS moved the client to stranger foster homes, where he moved 5 times. The eviction triggered mental health crisis in grandmother. So cruel, unnecessary + not remotely cost effective for DC.